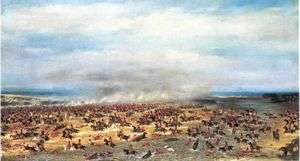 The Battle of Tuyutí was a Paraguayan offensive in the Paraguayan War targeting the Triple Alliance encampment of Tuyutí. It is considered to be the bloodiest battle in South America. :94 The result of the battle was an allied victory which added to Paraguayan troubles that began earlier with failed offensives and the loss of its fleet in the Battle of Riachuelo. Another attack on the allied camp was made in November 1867. 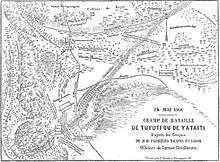 Map of the Battle of Tuyutí. In this phase of the war the Allies' strategic objective was to take the Fortress of Humaitá, the gateway to Paraguay. They intended to launch an amphibious operation, which required their land forces to take the fortress from the rear. After crossing the Paraná River from Argentina and landing in Paraguay, they had a long march across country studded with lagoons and carrizal (reed beds growing in marsh). The fortress was defended by the extensive earthworks of its Polígono or Quadrilateral design. It was in this context that the Battle of Tuyutí occurred. In early May 1866, the Paraguayan attack at the Estero Bellaco marsh failed. The allies camped for over two weeks before resuming their advance on 20 May 1866. Paraguayan leader Francisco Solano López moved his headquarters to Paso Pucu, where he dug trenches in the passes from Gomez to Rojas. :53 After learning that the Allied army planned to attack on the 25th, Lopez ordered a surprise attack on Tuyutí, "a swampy, scrub-brush savannah", for the 24th. The 24 May 1866 battle of Tuyutí is known as the First Battle of Tuyutí; the second Battle of Tuyuti (1867) occurred on 7 November 1867. 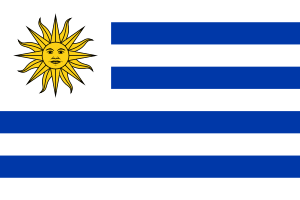 The attack began in the center, where the Uruguayans were forced back along with some Brazilian Volunteer battalions. On the left of the Allied encampment, Captain Emilio Mallet had ordered the construction of a large moat in front of his artillery pieces. When the Paraguayan onslaught reached it, they were in grapeshot range and unable to cross the obstacle. The Paraguayans tried to circle the artillery, avoiding the incoming fire, but encountered Antonio Sampaio's 3rd Infantry Division. This unit fought desperately in the muddy terrain though their commander died in the process. At this point, Osório ordered his reserves to attack and repelled the Paraguayan center. Soon the battle turned into "a series of charges and countercharges, a Latin American version of Waterloo". The Paraguayan columns continued to attack, but could not overcome the allied firepower. :54 In the words of Colonel Thompson of the Paraguayan army (a veteran of the battle), "At 4 p.m. the firing was over, the Paraguayans being completely defeated, and their army destroyed. The Allies had suffered severely also, but they still had an army left. The Paraguayans left 6,000 dead on the field; the Allies only took some 350 prisoners, all wounded. This was because the Paraguayans would never surrender but, when wounded, fought on till they were killed. 7,000 wounded were taken into the Paraguayan hospitals from this battle, those with slight wounds not going into hospital at all. . . . The Allies lost above 8,000 killed and wounded." There have been contradictory reports about the casualty numbers and debates over the true values. Centurión, reported that Paraguayan dead numbered about 5,000, maybe more, and the wounded 7,000, while the allies lost 8,000 killed and wounded. Thompson agreed with the number of Paraguayan wounded, but claimed that 6,000 were killed. Other authors give different numbers: in Barreto's opinion 6,500 Paraguayans were killed, while allied casualties were 3,647, with 3,011 Brazilians. 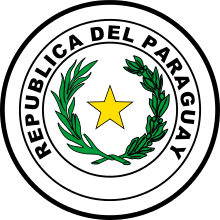 According to Silva Pimentel 7,000 Paraguayans were killed. Rawson and Beverina also declared that 7,000 Paraguayans were killed along with "so many others wounded", while the allied casualties were 4,000. Osorio's Order of the Day affirmed that the Paraguayan dead numbered "more" than 3,000, with 200 wounded and 21 prisoners; according to this document, Brazilian casualties were 412 killed and 2,003 wounded. Tuyutí was the last major Paraguayan attack. Ultimately, it was a devastating Paraguayan defeat. "The 10,000 men who had not been killed or [seriously] wounded were completely scattered and disorganised, and it was some days before they were again collected", wrote Thompson. "The Allies buried some of their own dead, but they heaped up the Paraguayan corpses in alternate layers with wood, in piles of from 50 to 100, and burnt them. 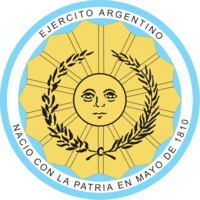 They complained that the Paraguayans were so lean they that they would not burn". 1 2 3 Doratioto 2003, p. 222. ↑ Farwell, Byron (2001), The Encyclopedia of Nineteenth-Century Land Warfare: An Illustrated World View, New York: WW Norton, p. 831 . ↑ Thompson, The War in Paraguay, p.149. 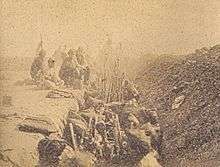 Wikimedia Commons has media related to Battle of Tuyutí. AZEVEDO PIMENTEL, Joaquim S. de. 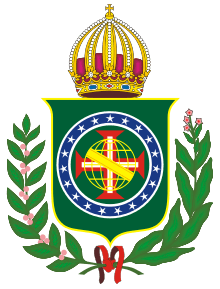 Episódios militares. Rio de Janeiro: Biblioteca do Exército, 1978. Doratioto, Francisco (2003), Maldita Guerra: Nova história da Guerra do Paraguai [Damned War: new History of the Paraguayan War] (in Portuguese), São Paulo: Companhia das Letras . Dupuy, Trevor N (1991), The Harper Encyclopedia of Military History: From 3500 BC to the Present (4th ed. ), New York: HarperCollins . Kolinski, Charles J (1965), Independence or Death: The Story of the Paraguayan War, Gainesville: University of Florida Press . Leuchars, Chris (2002), To the Bitter End: Paraguay and the War of the Triple Alliance, London: Greenwood . Murad, Abid (1957), A Batalha de Tuiuti e Uma Lição de Civismo [The Battle of Tuyutí & a lesson in patriotism] (in Portuguese), Rio de Janeiro: Biblioteca do Exército . Scheina, Robert L (2003), Latin America’s Wars, 1: The Age of the Caudillo, 1791–1899, New York: Potomac . Thompson, George (1869), The War in Paraguay, London: Longmans, Green & Co .
Williams, John Hoyt (2000), "A Swamp of Blood: The Battle of Tuyuti", Military History, 17 (1): 58–64 .